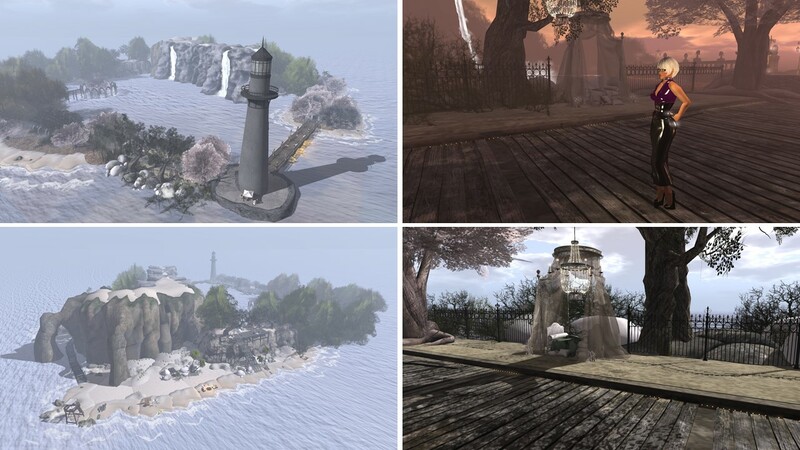 For my simploring tour on Saturday, October 20th, I selected Winter Moon from scoop.it SL Destinations. There’re a lot of reviews about Winter Moon already, it seems to be quite popular, yet I’ve never been there before. Winter Moon is a homestead rated PG, it is group owned by a group also named Winter Moon, which was founded by Dream Shadowcry. Joining the group is for free. As far as I could find out, the sim was created and is really owned by Dream Shadowcry. And it is quite popular indeed. The group has close to 3,000 members, and during my visit I was not alone at all, there were 10 other people around. Winter Moon is an island in the form of a hoof. One part of the hoof is dominated by a steep massive rock, the other part is quite flat and on it’s end is a huge lighthouse that towers above the whole island. The bay, formed by the hoof is not open, as a bridge leads from the lighthouse over the bay to the other end of the island. The windlight setting is a bit foggy and set to immerse the island in a warm reddish sundown atmosphere. I switched the light to my favourite setting for simploring, which is “Annan Adored Realisitc ambient”. The provided landmark for Winter Moon leads to a point close to the lighthouse, an alley with some upholstered furniture at the sides, chandeliers are suspended from the branches of the trees. It looks like a mixtures between indoor and outdoor, like a living room under the sky – and yes it looks very romantic. I walked up to the top of the lighthouse to get an overview, then I walked all around the island, crossing the bridge that connects the both ends of the hoof. What I noticed right when I landed continued. Winter Moon is a very romantic spot, there’re innumerable places to sit and cuddle, one spot more inviting than the other, a fantasy world yet not science fiction, just lovely. Sofas, beds, loungers, chairs, benches … and all offer a nice view into the beautiful and really peaceful environment. At Winter Moon you have the difficult choice between a romantic spot on the beach, or overlooking the beach, or in the forest, or looking at the waterfalls that run down from the big rock into the bay, or close to the lighthouse, or on the bridge or in the middle of the bay where some arcardes form a circle. As mentioned before, I was not alone during my visit and some spots were taken, but there’re so many that you will find a romantic spot far from other visitors any time. And I can understand now why Winter Moon is popular. I enjoyed my visit a lot. Thank you Dream Shadowcry for providing this romantic hideaway to the public. I will return whenever I look for a place to cuddle with my love.